From 23 to 24 April 2015, Mr Adama Dieng, the United Nations General Secretary’s Special Adviser on the Prevention of Genocide, the Centre and the Government of Morocco organized the first in a series of forums with and for religious leaders. The first Forum took place in Fez, Morocco, and brought together 26 representatives of different religions and faiths and faith based organisations, as well as religious scholars and experts, both women and men, from Africa, Asia, Europe and the Middle East. Participants were briefed on the international legal framework for the prevention of atrocity crimes, the elements of the crimes, and strategies for identifying and responding to incitement to violence that could lead to atrocity crimes. The constructive discussions on the role of religious leaders and faith based organizations in preventing and countering incitement resulted in the Action Plan for religious leaders to prevent incitement which could lead to atrocity crimes. Participants also agreed on the elements of a draft declaration of principles (the “Fez Declaration”). Discuss how countering and preventing incitement can increase the resilience of to atrocity crimes. Each regional meeting serves to develop a regional strategy for implementing the Action Plan. 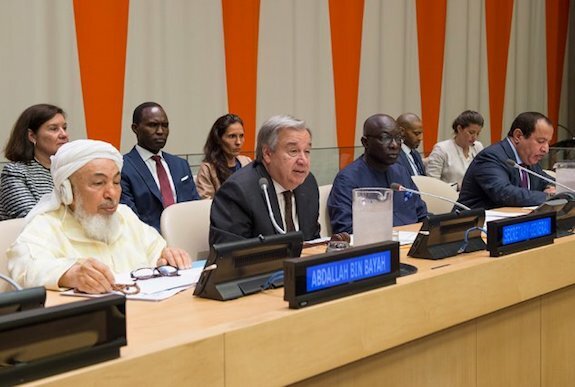 United Nations Secretary General António Guterres, along with religious leaders of the world, announced the launch of this new initiative to curb atrocities rooted in faith-based incitements to violence, on Friday July 14th 2017 in New York. He was joined by Adama Dieng of Senegal, the UN Special Adviser on the Prevention of Genocide. Dieng said the plan has been designed to counter the kind of ideology that led to the genocide against the Yazidi minority group at the hands of Islamic State (ISIL) militants. The plan relies on the role of faith leaders in preventing violence and taking early action in conflicts that may escalate into genocide, crimes against humanity and war crimes. “The voice, the authority, and the example of religious leaders are critical,” Guterres said. Among those leaders was Abdallah bin Bayah, a globally recognized Islamic scholar and jurist from Mauritania who studied law in Tunisia. He is known for his calls to peace and opposition to terrorism. Also on hand was Faisal Bin Muaammar of Saudi Arabia, head of the KAICIID international dialogue center in Austria that worked closely with World Council of Churches and other groups on the plan. In all, a total of 232 religious leaders and actors from 77 countries, including the United States, took part in the consultations. Participants included Buddhists, Christians, Muslims, Hindus, Jews and Sikhs from different groups and denominations, as well as representatives from various religious minorities, including Bahai, Kakai, Yazidi, and Candomblé, and humanists. At least 30 percent of participants at all meetings were women. 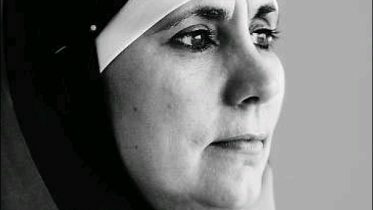 Be the first to comment on "UN SG, faith leaders launch Fez Plan of Action on religious violence"
Access the original article in the Virgin Islands Daily News here Bureau demands she remove headscarf for license photo; woman’s religious beliefs forbid it ST….